Engine swap--are all 327s the same? Recently I bought a buddy's newly machined L79 327 from his 1968 Corvette (he wasn't able to complete his own project). I figured it was as close as I'd get to having a 327 back in the car. I'm building the motor back to stock but not sure about how "swappable" the miscellaneous Corvette parts will be. I don't have the headers or the oil pan yet, so was wondering if those items will be usable in the Camaro. Alternators/starters all the same? It will not be a concourse car, but I'd like to stick to "original" or "original looking" parts as much as possible. Any other tips or pointers for this swap? I'm at the ground floor on the engine build so entertaining all thoughts. Rebuild the Rochester? HEI or install pertronix upgrade in the distributor (if I find it)? Re: Engine swap--are all 327s the same? I believe Corvettes used a 5 quart oil pan which will not fit a Camaro. Exhaust manifolds are also not interchangeable. The starter is determined by flywheel - 10.3" or 11". Everything esle should be fine. Personally--I'd go with the Pertronix--with an HEI you may have to dent the firewall to get the cap to clear, and that huge HEI doesn't look anywhere near stock. I'd also use a 600 Holley carburetor on an Edelbrock Performer manifold for better driveability and performance. If you're sticking with the stock Q-Jet manifold, a Holley Spread-Bore carburetor will beat that Quadrajunk every time and is well worth the money in my opinion. Hope this helps. I think 68 & earlier heads don't have accesory bolt holes.. I'm building the motor back to stock but not sure about how "swappable" the miscellaneous Corvette parts will be. 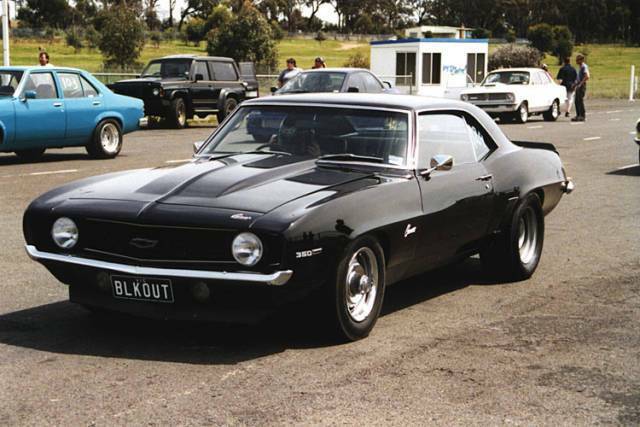 The '67 and '68 327 blocks are functionally the same and are dimensionally identical - anything that bolted up to the '67 block will bolt up fine on the '68 block, but you'll need the Camaro oil pan and exhaust manifolds. Cylinder heads with accessory bolt holes didn't show up until 1969.
thanks for the tips. the corvette oil pan was indeed too big and i kept the original headers to assist with the mounts for the A/C and alternator. i'm at the point of buying a starter. you mentioned that starter depended on the flywheel/flexplate size. guess i now have to ask, how do i know what size flexplate to buy? the engine i took out of the car (not original) was hooked up to the powerglide transmission (original) and the flexplate (not sure if original or not) looks to be a smidge under 13 inches. the new engine (327/350hp) was hooked up to a 4 speed, so i do not have that flywheel. Starter with the bolts in line will take a 153 tooth flexplate/flywheel - small. Starter with staggered bolts will take a 168 tooth flexplate/flywheel - large. Don't forget to install the starter front brace, it will save the nose from breaking. If you're sticking with "original" look I'd stay with the L-79 Intake Manifold. Again, if you're going with the "original" look, the L-79 Heads without any accessory bolt holes would be correct and with stock brackets not needed. And as stated above, I went with a Pertronix kit in my stock Distributor on my 327 in my '67. Should be an easy swap. A L79 Camaro geared right with a 4 spd would have taken more races than it would have lost...L79 is one option I always thought they should have offered in the Camaro, I always guessed it would have competed with the SS 350 sales too heavily. One of my best friends in 1968-70 (I was in the USAF) owned a '68 Chevelle with the L79 / 4 speed. It was rated 327 ci/325 hp in the Chevelle.. We beat MANY SS396 chevelles with that car... I loved it... 327 ci engine was one of my favorite of all the Chevy engines, with it's great compromise between revvable HP, and drivability torque. If that engine had been offered in the Camaro, why would they have needed the 350??? The 350/300 would have been a step down..
X2 those L79's were one mean and potent combinations that made gobs of power giving the Small Block a reputation as a fierce beast. If your L79 was rebuilt with the stock spec L79 camshaft, you'll find it works very well with an automatic or standard transmissions. Not too radical an overlap, draws good vacuum so power brakes function correctly, won't load up at idle like more radical cams do. It actually works very well in 350's, much better than the stock 300 horse cams. I love the idle quality, plus the power. Don't get me wrong - my 302 solid lifter is still my favorite, but the L79 hydraulic runs a good second place. If you want to look stock, keep in mind the 68 had pcv valve in the valve cover, 67,s did not. It is not just a valve cover thing it is a totally different system. I'll have to take a look at the valve covers I bought. I remember it being more difficult than I expected to track down ones that at least looked the same. It has been a while since the motor was put together and left in storage. When you talk about the PCV valve in the cover, you mean there is a hole in the cover for a line to go to a PCV valve, or the actual PCV valve is in the valve cover? I can't recall if I bought ones that looked the same or were actually working reproductions of the 1968 valve covers. How would I tell the difference next time I'm looking at it? 67 and older engines were vented from the oil filler and a canister in the lifter valley which led to a hole near the distributer. In 68 this canister and the hole went away. Ventilation was done with a hole in each valve cover, one to let air in and the other to draw out crankcase air. So when you look at a 67 engine there are no holes in the valve covers and 68,s had one in each. these are two different systems. The deal is if you want it look like a 67 you will need a 67 or older block. If you want it to look that correct.